The Claridge Hotel was built in 1930 during the great depression by John McShain. It is 24 stories high and had 400 hotel rooms. Brighton Park was directly in front of the hotel and it was borderd by Park Place. Until recently The Claridge Hotel was still in operation as part of the Bally's Casino Hotel complex, and it included a casino. Hoever in 2014 it was sold to TJM Atlantic City, a subsidiary of TJM Properties of St. Petersburg Fl. The Claridge is now a Radisson hotel. Postcard by E. C. Kropp Co. - from the collection of Thomas Topham. The 24 story Claridge Hotel opened in 1930, during the great depression. General Electric provided the Fountain of Light that was in the center of Brighton Park, in front of the Claridge, to celebrate the 75th anniversary of the invention of the light bulb by Thomas Edison. The Marlbourough hotel was at the left, and the Brighton hotel to the right. Marilyn Monroe stayed at the Claridge during the fifties when she was grand marshal of the annual Miss America Pageant. Other famous guests included Frank Sinatra, Bob Hope and Princess Grace of Monaco. The Claridge hotel still exist and is in operation. 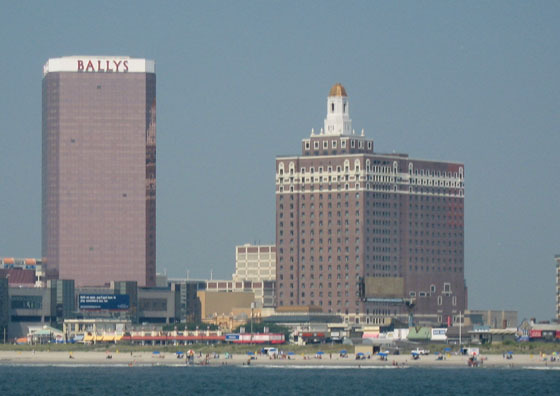 In 1981 the Del Web Corporation bought the Claridge and converted it to a casino. The Claridge was subsequently bought by Bally's in 2003, and became part of the Bally's Casino Hotel complex. Bally's 49 story casino-hotel towers over the nearby Claridge. Recently the Claridge had a $20 million upgrade and now has 500 modern guest rooms. The Caridge was recently sold and reopened in May 2014 under new management as a Hotel Property-Non-Casino. The Claridge has new restaurants, a Lobby Bar, and new entertainment venues.